RICHMOND – The affluent suburbs of Northern Virginia are the healthiest communities in the state, and lower-income localities, especially in the southern and western parts of the commonwealth, have the most serious health problems, according to a recent study. The Robert Wood Johnson Foundation reported that for the third year in a row, Loudoun, Fairfax and Arlington are the healthiest counties in Virginia. They share low rates of premature death and a high percentage of adults with education beyond high school. But Petersburg, Emporia and Martinsville ranked lowest in the foundation’s eighth annual county health report. Those three localities all had high unemployment and high rates of child poverty – factors associated with poor health. The rankings are based on health outcomes and health factors. Health outcomes include the length and quality of life; health factors include behaviors such as smoking, access to care, social and economic conditions and physical environment. Hicks and his team at the Virginia Department of Health use the statistics from the Robert Wood Johnson Foundation to start conversations about communities’ health needs and to work with residents to best utilize resources. In Petersburg, the community health assessments have led to efforts to reduce teen pregnancy. In 2011, the city’s teen pregnancy rate was 101 pregnancies per 1,000 females ages 15-19. According to the most recent report, the rate has dropped to 87 pregnancies per 1,000 females in that age category. However, not every locality is showing progress. In 2016, Hopewell was ranked 118th in Virginia. But in the most recent report, Hopewell dropped to 126th among the state’s 133 counties and cities. Among the factors: Thirty percent of Hopewell residents live in poverty, and more than half of the children there live in single-parent households. RICHMOND – Women across the country demanding equality. African Americans protesting racism. Government officials worried about Russian interference. Those descriptions may reflect today’s headlines. But they also mirror what was happening a century ago – as America was coming out of World War I. 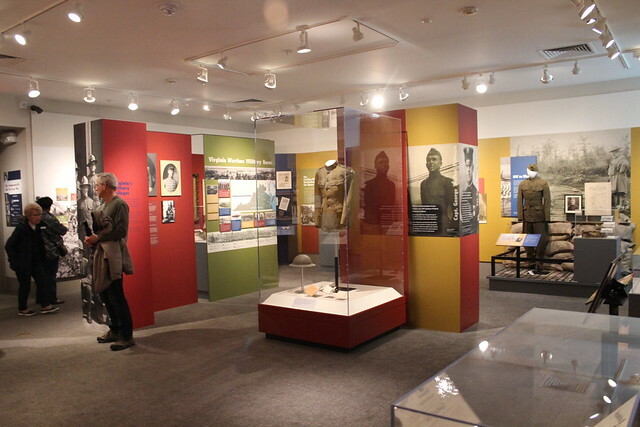 “WW1 America” is a traveling exhibit from the Minnesota Historical Society; Richmond is the exhibit’s only stop on the East Coast. “The Commonwealth and the Great War” was created by the Virginia Museum of History and Culture to highlight Virginians in the war. Horrigan started the project three years ago with the desire to “look more broadly at America and Americans.” He wanted to focus less on the horrors of the trenches and propaganda and instead examine the turmoil at home. Just as the Black Lives Matter movement has pushed for societal reforms in recent years, African-Americans were fighting intense racism during World War I: The U.S. military then was segregated; blacks were relegated to menial jobs, and there were only two African-American combat units – both commanded by white officers. After the war, black soldiers returned to a segregated society; their heroism was ignored. The exhibit also highlights issues of women’s suffrage – the #MeToo movement of its time – as well as workers’ rights and care for disabled veterans. In addition, during World War I, Americans were terrified of Russia, believing that the Bolsheviks were preparing to invade America. The exhibit shows how this fear developed into the Cold War. Horrigan’s favorite part of the exhibit is a glass bowl used to pick men for the draft. Americans had never seen the government conduct such a massive call to arms. All men age 18 to 45 had to enter the draft. By the end of the war, nearly 20 percent of all draft-age men had served in the military. The second exhibit, “The Commonwealth and the Great War,” focuses on the men drafted from Virginia and the families they left behind. Approximately 100,000 Virginians fought in World War I, and 3,700 died in service. With the exception of Fort Myer and Fort A.P. Hill, all of Virginia’s major military bases were built during World War I. The exhibit includes pictures and stories from the men at these bases and highlights some of Virginia’s accomplished soldiers. However, the exhibit honors more than Virginia’s soldiers. Pictures and artifacts reflect the significant role Virginia women played. Many women were nurses, helped organize fundraisers and made items to send to troops. Horrigan said the Virginia Museum of History and Culture did an outstanding job complementing the traveling exhibit. “What it has done with the second exhibit really makes this whole thing much more significant, giving it a personal Virginia side,” Horrigan said. He also sees parallels between the museum’s contents and contemporary America. “Every time you turn around in that exhibit, you see some connection to today,” Horrigan said. “WW1 America” will be on display at the Virginia Museum of History and Culture, 428 N. Boulevard in Richmond, until July 29. “The Commonwealth and the Great War” will be available until Nov. 18. Museum admission is $10. While most of Virginia shuts down at the threat of snow, Ashley Caldwell thrives in it. Caldwell, 24, started practicing gymnastics at 4, and after watching the freestyle skiers in the 2006 Winter Olympics, she was inspired to take her talents to the snow. Now, Caldwell is competing in her third Olympic Games. An Ashburn native, Caldwell and her parents quickly realized suburban Northern Virginia was not the best place to start a career in skiing. So at 14, she moved to Lake Placid to train with the U.S National Development team. Two years later, Caldwell was the youngest American to compete in the 2010 Vancouver Games. Among five freestyle skiing events in the Winter Olympics – moguls, aerials, ski halfpipe, ski cross, and ski slopestyle – Caldwell competes in ladies’ aerials, in which she skis off a 2- to 4-meter jump and attempts tricks such as flips and twists. Caldwell is best known for her trick – the full, full, full – which involves three somersaults while twisting her body. This trick is traditionally performed by men; at the 2014 Winter Olympics in Sochi, Russia, Caldwell was the only female to attempt the trick, and she completed it. Caldwell’s career stalled in December 2011 when she tore the ACL in her right knee and a year later when she tore her ACL in her left knee. Those injuries didn’t stop her from skiing, though: In 2014, she competed in the Sochi Games. Caldwell’s most recent triumph was at the 2017 Freestyle Ski and Snowboard World Championships in Spain, where she took first place. Caldwell’s first appearance in Pyeongchang will be Thursday in the ladies’ aerials qualification. She is looking forward to the event. “I’m prepared to be unprepared. I’m ready for anything that comes at me during this Games,” Caldwell said. RICHMOND – While campaigning door to door, Del. Danica Roem met a constituent who had lost her only child to suicide. The mother had one request – make suicide prevention training available to all school employees. 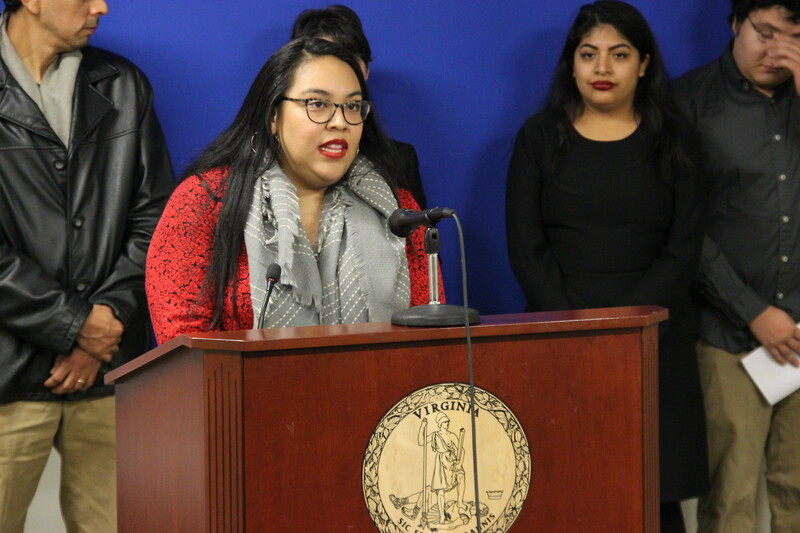 Now Roem, D-Manassas, has introduced HJ 138, a joint resolution that would request all Virginia school boards provide every employee with resources or training on how to identify students at risk of suicide. “This is something that is incumbent upon all of us at the General Assembly, regardless of party label, to make sure that we are working together to take care of our kids and working together to make sure that the caretakers of our children, from maintenance professionals all the way up to the principals, are able to see our kids for the lives they are living and identify the struggles that they have,” Roem said. Suicide is one of the leading causes of deaths for people age 10 to 18. In 2015, 1,097 people in Virginia died by suicide, and 35 of those suicides were carried out by children under 18, according to the Office of the Chief Medical Examiner. While school districts would not be required to comply with the resolution, it is meant to motivate them to take steps toward suicide prevention. The resolution would expand on SB 1250, a 1999 law that required all licensed school personnel to report a child they suspect might be suicidal. However, it did not require those professionals be trained on how to identify students at risk. When it was passed, SB 1250 also mandated that the Board of Education and Department of Behavioral Health and Developmental Services create a Code of Virginia Suicide Prevention Guidelines. HJ 138 has been assigned to a House Rules Subcommittee and is scheduled to be considered on Friday. Roem’s resolution is co-sponsored by 10 Democrats and one Republican – Del. Matthew Fariss of Appomattox County. “Anything that would make us smarter about suicide as a society, I think, is something we need to try to do,” Fariss said. RICHMOND — Legislation aimed at protecting and improving employees’ worker compensation rights were struck down Tuesday by a House subcommittee. Freshman Del. Lee Carter, D-Manassas, proposed three bills in an effort to reform the Virginia Workers’ Compensation Act after he was inspired by his own experience filing a claim. All three bills were passed by indefinitely by a subcommittee of the House Commerce and Labor Committee, effectively killing them for the session. One of the bills, HB 460, would have prevented employers from firing someone based on the belief that the employee had filed or was planning to file a claim for workers compensation. Currently, Virginia law only protects employees from being fired solely because they have made or are planning to make a claim. However, this bill would have protected employees from being fired for any reason that was motivated by the knowledge or belief that the employee was planning to file a claim. Ryan Dunn from the Virginia Chamber of Commerce said the bill was too general. “This is really a golden ticket to allow somebody, even after they are fired for due cause or decide to quit, (that) they can at any point come back and say that this was related to their workers’ comp claim that they put in in 1985,” Dunn said. The second measure, HB 461, known as the timely notice bill, would have required employers to respond to a workers’ compensation claim within 10 days of the initial claim and explain why it was denied. The bill would cut employers’ response time in half; Joe Leahy of the Independent Insurance Agents of Virginia said that is not enough time to investigate a claim. Carter’s third bill, HB 462, would have ensured that Virginia employees injured while working outside the state could still file for compensation from their employer in Virginia, increasing their employers’ liability. Again this bill was met with opposition. Subcommittee Chairman Gregory Habeeb, R-Salem, agreed with Carter that “our system is not super-claimant friendly,” but disagreed with the proposed solution. Carter was not available for comment after the subcommittee meeting. RICHMOND – The unstable nature of relying on tips to make a living is reflected in the paychecks of restaurant servers like Connor Rhodes, who has been serving Richmond’s restaurant goers for four years and says it’s not unusual for his paycheck to be zero dollars. That’s because he earns $2.13 an hour – a “subminimum wage” – which, after taxes, can result in an empty wallet if tips are weak and shifts are sparse. “Depending on business, there’s no guarantee that we’ll get shifts that can pay the bills,” Rhodes said, explaining that servers typically have to save their wages from peak seasons to survive during the slower months. But two state legislators have proposed a bill, HB 1259, that would do away with the “subminimum wage,” which is paid to workers like Rhodes who are exempt from receiving the federal minimum. That $2.13 an hour, along with tips, makes up the entire income of these workers. As long as the federal minimum wage of $7.25 is met through tips received, employers are not required to pay their employees more than the subminimum. If customers neglect to tip their server after their meal, it can end up costing the server money to have served the table at all. “At the end of the night, the servers have to tip out the food runners, the bartenders and the bussers based on our food and alcohol sales. So say someone orders $50 bottle of wine; I tip the bar 5 percent of that $50. I need at least $2.50 to break even from taking care of a customer, and sometimes the costs can go a lot higher. It’s rare that the restaurant will compensate us,” Rhodes said. According to a 2014 report by the Economic Policy Institute, the median hourly wage for U.S. restaurant workers, tips included, was $10 an hour – compared with $18 an hour for workers in all other industries. After accounting for demographic differences, the report said restaurant workers earned 17 percent less than similar workers in other industries. Under HB 1259, servers and certainother employees who are exempt from the minimum wage would no longer have to rely on the generosity of others, through tips, in order to meet the minimum wage. HB 1259 was introduced by Dels. Paul Krizek and Jennifer Boysko of Fairfax. Eight other Democrats are co-sponsoring the measure. The bill would also make it illegal for employers to pay laborers in certain service industries traditionally held by African-Americans – like shoe-shiners and doormen – less than minimum wage. RICHMOND – More than half a century after the end of Jim Crow laws that enforced racial segregation in the South, legislators are finding remnants of racism in Virginia law. The common thread among those professions? When the law was written in 1975, they were all considered low-income, low-skill jobs overwhelmingly occupied by African Americans who were systematically denied advanced employment opportunities. Now, two members of the Virginia House of Delegates – Paul Krizek and Jennifer Boysko, both Democrats from Fairfax – are sponsoring legislation to delete such outdated language from state law. The language was originally pulled verbatim from North Carolina’s legal code, which was written a decade earlier, in 1965. “There is some fairly widespread agreement and research supporting the conclusion that a lot of these exemptions were based on race,” said Ann Hodges, a professor at the University of Richmond School of Law. The wage discrimination doesn’t stop at race. Virginians with mental, intellectual and physical disabilities also may receive subminimum wage because their “earning capacity is impaired,” according to the state code. According to Hodges, at the time the law was written, many people believed that individuals with intellectual, physical and mental disabilities could not be as productive and generate as much labor as able-bodied workers. “There was a sense that if you couldn’t pay them less, they probably wouldn’t be employed at all,” Hodges said. The bill would affect other employees, such as restaurant servers, in addition to the positions the sponsors say are directly connected to race. “While doing research for a $15 minimum wage bill, I was angry and disappointed to learn that the Virginia Code includes exceptions to its minimum wage law that are clearly racist, meant to exclude jobs that have been mostly held historically by minorities,” Boysko said. HB 1259 has been assigned to the House Committee on Commerce and Labor. RICHMOND – Virginians had a lot of reasons to endure biting cold temperatures Saturday to witness Ralph Northam's inauguration as governor. Some of the estimated 5,000 spectators came with a plea of help. Some wanted to witness democracy in action. And others had dedicated themselves to the Northam campaign. Sophin Sok, a Richmond resident from Cambodia, said she came to the inaugural ceremony in hopes of getting Northam’s attention to pardon her fiance, who has been detained for three months and faces deportation. “He came here at the age of 3, and he’s the biological father to three of my kids.” Sok said. “About a decade ago, he plead guilty to a charge, but he served his time, paid his debt to society and he turned his life around and pretty much put his family as a priority. “They didn’t prepare him for anything, they just took him. They didn’t allow us to prepare ourselves -- so now it’s kind of hard for me because he is the main provider also and he’s a great father,” Sok said. Sok said she and her fiance have children ages 1, 2 and 6. They want Northam to write a pardon letter so he can come home and get a second chance to stay in America. For Kevin Miller of Danville, the inaugural parade brought a special family meaning. He came to watch his son perform with the George Washington High School marching band. “It’s a great honor for them and an opportunity for them to do something they don’t get to do very often,” Miller said. The ceremony and parade showcased Virginia's diversity. The day opened with the Pledge of Allegiance, led by Boy and Girl Scouts from the All Dulles Area Muslim Society Center. And it closed with the blessing of the grounds by representatives of Virginia's Indian tribes. Universities from across the state took part in the parade, as did such groups as Equality Virginia, the Cultural Center of India and the Charlottesville Cardinals Wheelchair Basketball Team.